I like how Bluetooth technology has evolved so much that there are now devices geared specifically towards a single purpose - in the case of these two gadgets, the workout/exercise crowd. While these headsets can still be used for making/receiving phone calls, that feature is now minor compared with other purposes - giving you good sound for music/podcasts/radio, long-lasting battery life and the ability to remain sweat-proof/waterproof for outside or strenuous exercise. What is it? The latest BackBeat wireless earphones/earbuds from Plantronics include several improvements in comfort, durability, battery life and keeping moisture away from the inside of the headset. The FIT earbuds fit comfortably inside your ear, with a built-in hook that goes around the outside of your ear (for stability), and an adjustable ear loop for the inside for a more secure/comfortable fit. On one earbud there is a button for volume control and the ability to play/pause and skip/previous song, and on the other earbud is the power button and the ability to answer/end incoming phone calls. The two earbuds are connected to each other by a flexible cable that wraps around the back of your head. But connecting the FIT to your phone/music player is done via Bluetooth, eliminating a cord that often gets tangled or in the way during a workout. The system comes with a handy neoprene carrying case that you can turn inside-out to give you a workout armband, and there’s an app (both iOS and Android) that gives you further functionality (although these worked just fine with third-party music apps). Two color styles are available - a neon-ish green or bright sky-blue, which will certainly stand out with whatever you’re wearing (I’m pretty sure that 1980s gym-wear hasn’t made a retro comeback yet). Why it’s cool: Plantronics claims the FIT is “your perfect workout partner” and it’s hard to disagree. The earbuds are comfortable to wear for long stretches, yet secure enough where you don’t feel they’re going to fall out of your ears during a run or other strenuous activity. Previous versions of the BackBeat were criticized for not being sweat proof - a little bit of moisture would fizzle/short-circuit the headphones. That’s not the case with the FIT earbuds, which utilize “Sweat Proof technology by P2i”, which now makes me wonder about how they test the sweat-proof functionality and who gets that un-enviable job. In any case, I was able to sweat to my heart’s content and not have any issues with the FIT earbuds. Even a quick trip to the gym’s steam room couldn’t produce a short-circuit of the BackBeat FIT. The reversible armband was a nice design touch, but even more impressive was the system’s battery - a fully charged system gives up to eight hours of listening time, up to six hours of talk time, up to 14 days in standby mode and up to 180 days of “deep sleep mode." This basically means you won’t likely have to worry about whether the headphones will work when you’re ready for your workout (nothing more annoying than a drained battery when you finally psych yourself up to get to the gym). The scoop: Pump HD Sportbuds, by BlueAnt Wireless, about $130. What is it? A similar design to the BackBeat headphones, the Pump HD Sportbuds also fit comfortably on each ear, connected by a thin, flexible strap. 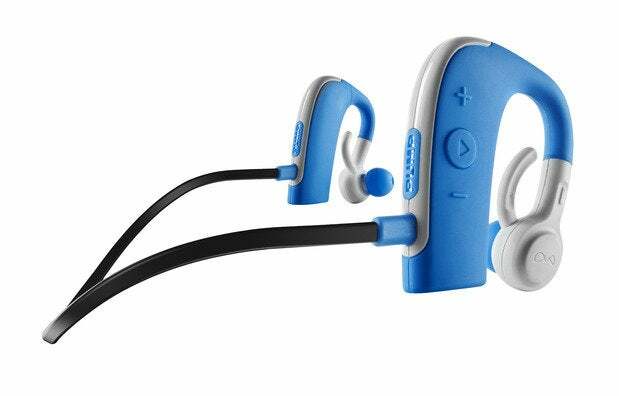 Not satisfied with being “sweat-proof”, the Sportbuds have “Teflon coating and Kevlar shielding” to help block elements like water, salt and dust from getting into the earphones or electronics. The Sportbuds include volume control and play/pause buttons, and let you make/answer any incoming phone calls if connected to a mobile phone. For a more secure and comfortable fit, the package includes three different sizes of seal tips (a fourth “Awareness Tip” is included if you want more outside noise to come into the headphones) and plastic “stabilizers” that fit on the outside of the ear. BlueAnt also includes a cable zip that can adjust the size of the behind-your-head strap so it doesn’t flop around as much during a workout. Why it’s cool: I felt more confident in outdoor activities using these headphones knowing that the waterproof nature of the Sportbuds could withstand things like getting water splashed on them (as well as sand/dust prevention). While you wouldn’t go jump in a pool or lake with these on, you could survive a quick downpour during a walk/run while wearing these (I’m sure the BackBeat FITs would also survive a rainstorm, but there may be a subtle difference between waterproof and sweat-proof terminology). Some caveats: The minus (-) lower volume button didn’t work on my set, which also prevented me from playing the previous song on a playlist (you need to hold the minus-button for two seconds for that to work). In addition, there were no “R” or “L” indicators to tell you which side they go on - it’s not a huge problem because the design is such that there’s only one way to put them on, but a small R or L on the right earbud would help this old guy. In addition, one person commented that these looked like a hearing aid, due to the heavy blocky piece that goes behind the ear. Comparing the two devices: They’re both great devices that eliminate the cable between your head and music player, providing great sound while remaining comfortable and secure enough to not fall off during your workout. The differences, then, are subtle. The BackBeat FIT offers the carrying case/armband as part of its package (which you may/may not need if you already use an armband, or if you place your phone on the treadmill or in your pocket), while the SportBuds offers the different sizes of seal tips and stabilizers (and the very cool cable zip), which may/may not be needed depending on how specific a fit you want to establish. Both offer extended battery life and USB charging cables that prevent you from using them on a dead-or-low battery.